All around the Sella Group there is a ski and road route also known as the Tuor of 4 passes that every year attracts tourists and mountain lovers all year round. The mountain group of the Dolomites, called Sella is located between the valleys of Fassa, Livinallongo, Badia and Gardena. 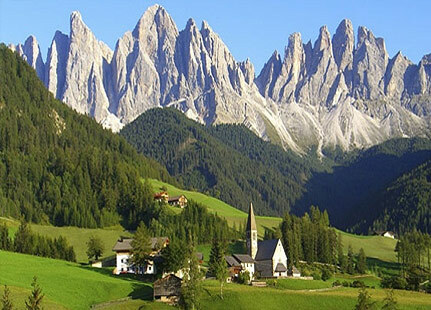 The mountain passes that can be overcome by completing the whole tour are: Passo Sella that connects Val di Fassa to Val Gardena, Passo Pordoi (2239 m) that connects Val di Fassa to Val di Livinallongo del Col di Lana-Fodom, Passo Campolongo (1875 m) that connects Val di Livinallongo del Col di Lana-Fodom to Val Badia and Passo Gardena (2121 m) that connects Val Badia to Val Gardena. The Sellaronda is a tour that can be done at any time of the year. The main feature of the tour are the wonderful views that can be seen from each step and along the entire route.